I will be the first to admit that I'm not much of a girly girl. I'd choose laser tag over a mani-pedi any day and would prefer to take out cars in Burnout than watch a chick flick. However, I do love pretty things and I do love catching up with my girls. 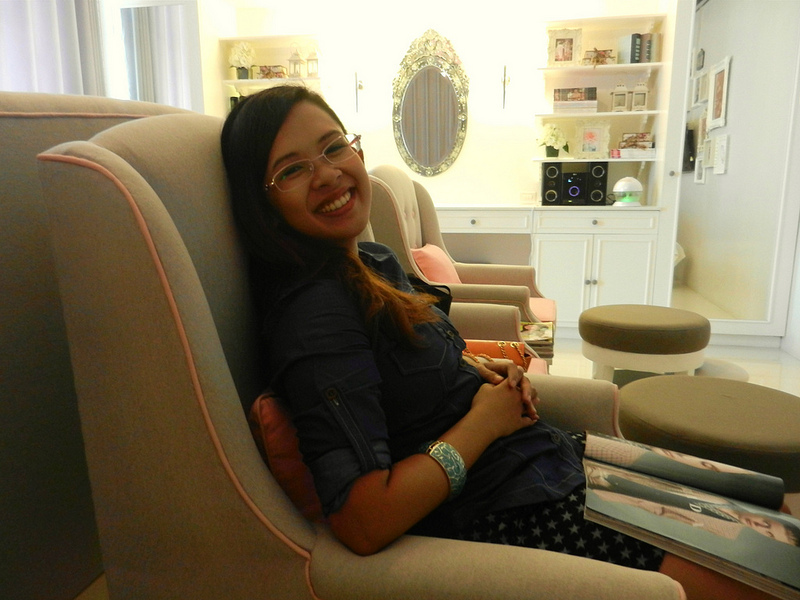 So, when the opportunity came up to review Pink Me Up Beauty Nail and Dry Bar, I dragged Jacky with me to the great and girly unknown and we enjoyed a couple of hours of girly-time together. That's right. Hours. Pink Me Up Beauty Nail and Dry Bar is located in Lee Gardens Condominium along Shaw Boulevard. The building is pretty easy to find and it's awesome coz they have a Starbucks downstairs (Starbucks makes everything awesome). However, I will admit that the maze-like interiors of the building creeped the hell out of me. The creepiness faded pretty quickly once we got to Pink Me Up itself, though. Why? Because their interiors look exactly the way my dream condo would look. I can already imagine all of my books lined up on those shelves. The closet princess in me was squealing in delight, I swear. Jacky enjoying a hand massage while reading Cosmo! Photo by and taken from Jacky. My favorite part: choosing my nail colors! Now, my biggest pet peeve when it comes to mani-pedis is that the nail polish chips so quickly and I end up wishing I had just done my own nails at home. Aside from nail services, they also have massage and hair services, which we sadly weren't able to try that day because we were excited to catch Magic Mike. :p We loved the experience, though! (Read Jacky's review here.) Thank you so much, Pink Me Up, for the wonderful treat. I can't wait to go back! look like you had a nice day. Wow, pretty interiors! It's near my place so this one is added up to my go-to pampering sessions with my bff :) thanks for this ate a! I never knew you had a princess in you.